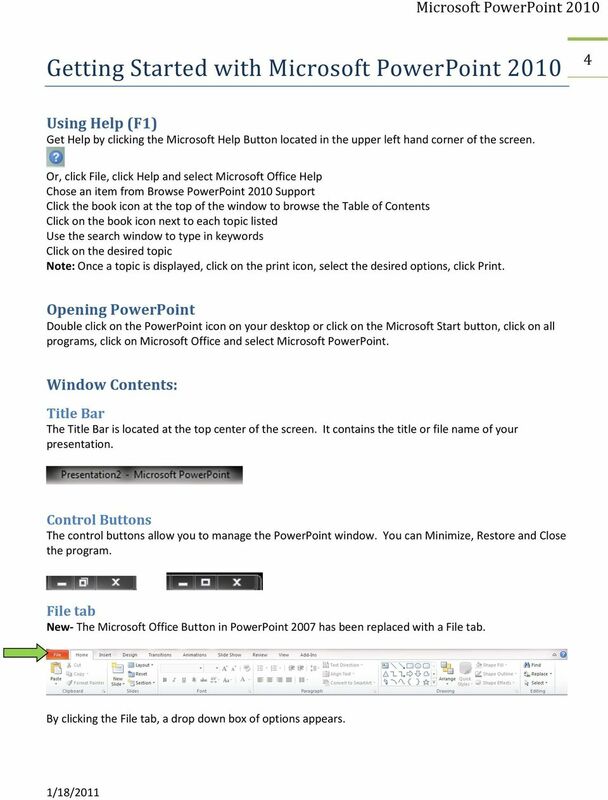 5 Getting Started with Microsoft PowerPoint Using Help (F1) Get Help by clicking the Microsoft Help Button located in the upper left hand corner of the screen. 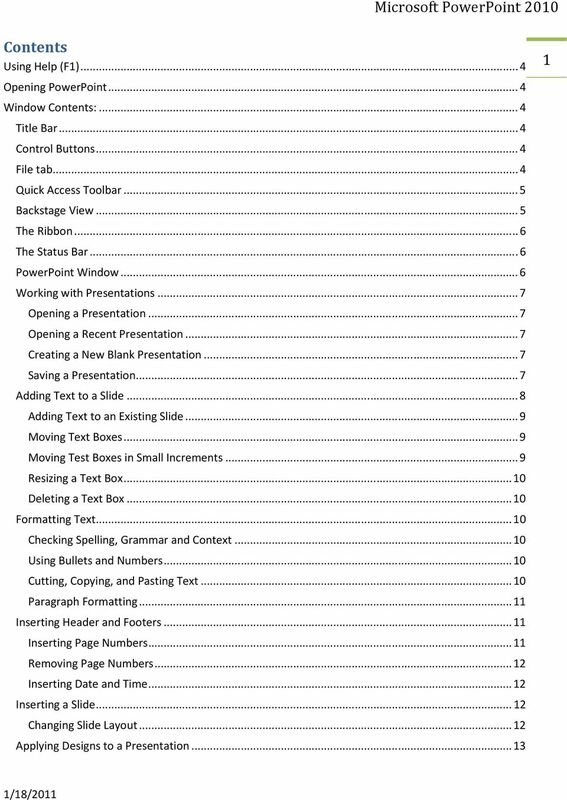 Or, click File, click Help and select Microsoft Office Help Chose an item from Browse PowerPoint 2010 Support Click the book icon at the top of the window to browse the Table of Contents Click on the book icon next to each topic listed Use the search window to type in keywords Click on the desired topic Note: Once a topic is displayed, click on the print icon, select the desired options, click Print. 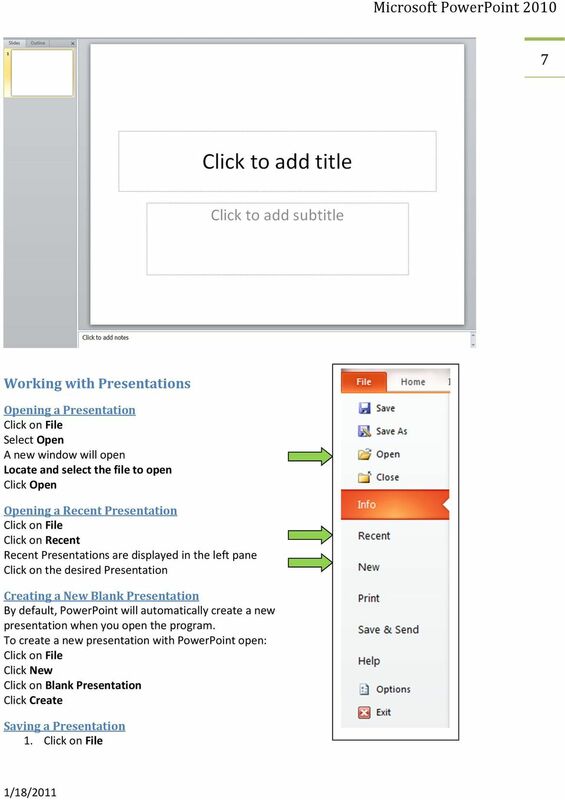 Opening PowerPoint Double click on the PowerPoint icon on your desktop or click on the Microsoft Start button, click on all programs, click on Microsoft Office and select Microsoft PowerPoint. Window Contents: Title Bar The Title Bar is located at the top center of the screen. It contains the title or file name of your presentation. Control Buttons The control buttons allow you to manage the PowerPoint window. You can Minimize, Restore and Close the program. 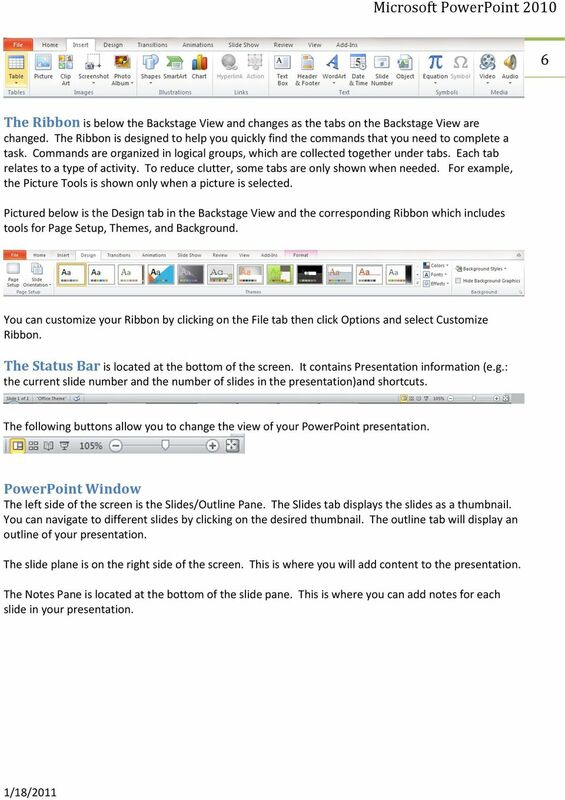 File tab New- The Microsoft Office Button in PowerPoint 2007 has been replaced with a File tab. By clicking the File tab, a drop down box of options appears. 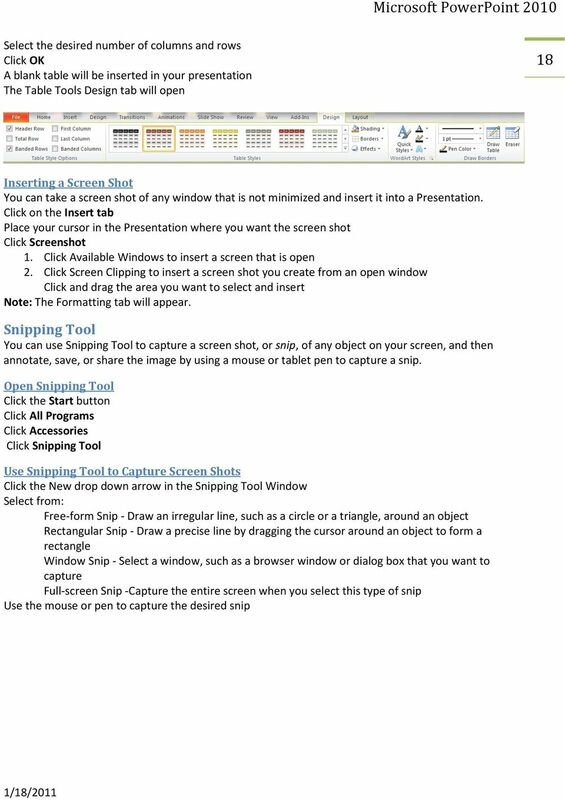 6 It allows users to Save, Save As, Open, Close, View Presentation Information (as seen below), Open Recent Presentations, Open a New Presentation, Print, Save & Send, Open Microsoft Office Help, Change Options and Exit. 5 Quick Access Toolbar-The top toolbar (above the File tab) contains shortcuts for tools. (e.g. : save, undo, redo, etc.) 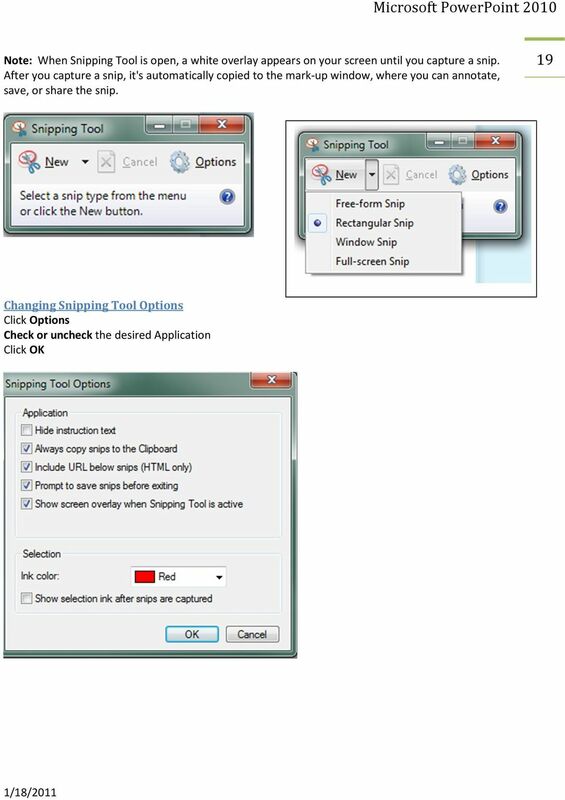 Note: Clicking the arrow will allow the user to select more tools for the toolbar. (e.g. 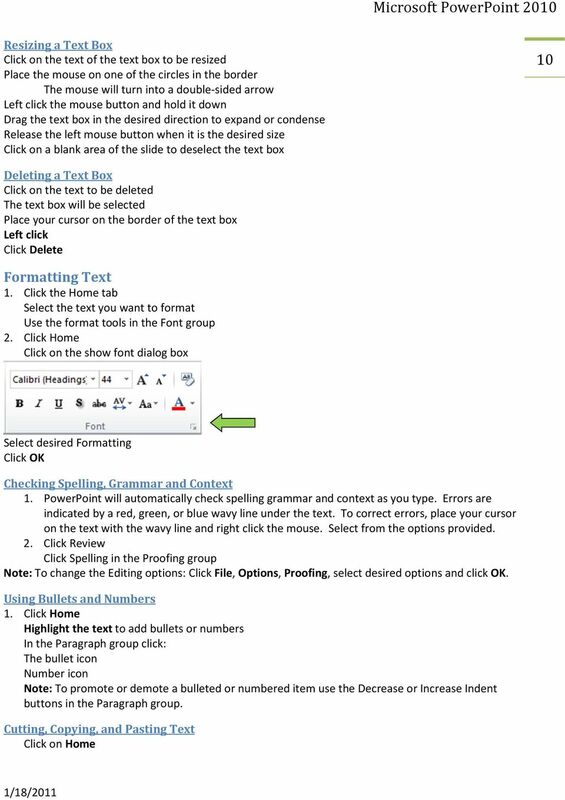 : New, Open, Save, , Quick Print, Print Preview, Spelling and Grammar, etc.) Backstage View Below the Quick Access Toolbar, is the Backstage View, which contains Tabs to work with files and settings. By clicking on the various tabs, different tools are displayed below the Backstage View in the Ribbon. The Home tab displays tools in the Ribbon for: Clipboard, Slides, Font, Paragraph, Drawing and Editing. Pictured below, the Insert Tab displays tools in the Ribbon for: Tables, Images, Illustrations, Links, Text, Symbols and Media. 7 6 The Ribbon is below the Backstage View and changes as the tabs on the Backstage View are changed. The Ribbon is designed to help you quickly find the commands that you need to complete a task. Commands are organized in logical groups, which are collected together under tabs. Each tab relates to a type of activity. To reduce clutter, some tabs are only shown when needed. For example, the Picture Tools is shown only when a picture is selected. 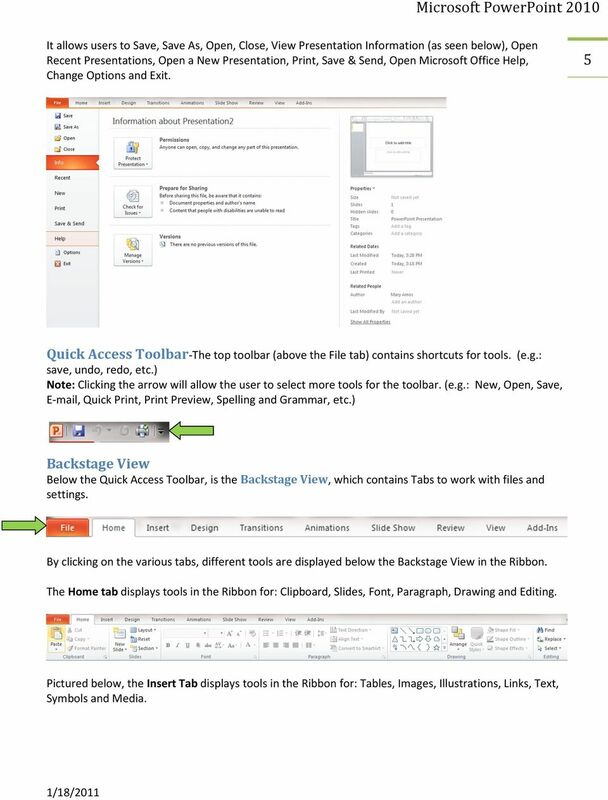 Pictured below is the Design tab in the Backstage View and the corresponding Ribbon which includes tools for Page Setup, Themes, and Background. You can customize your Ribbon by clicking on the File tab then click Options and select Customize Ribbon. The Status Bar is located at the bottom of the screen. 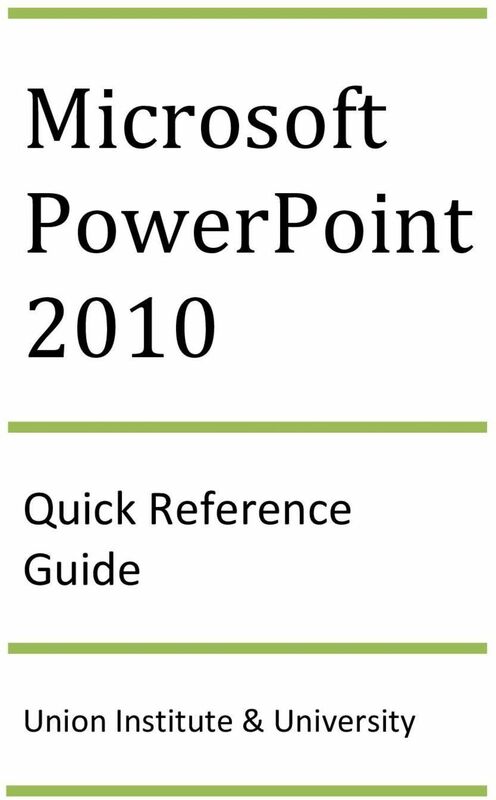 It contains Presentation information (e.g. 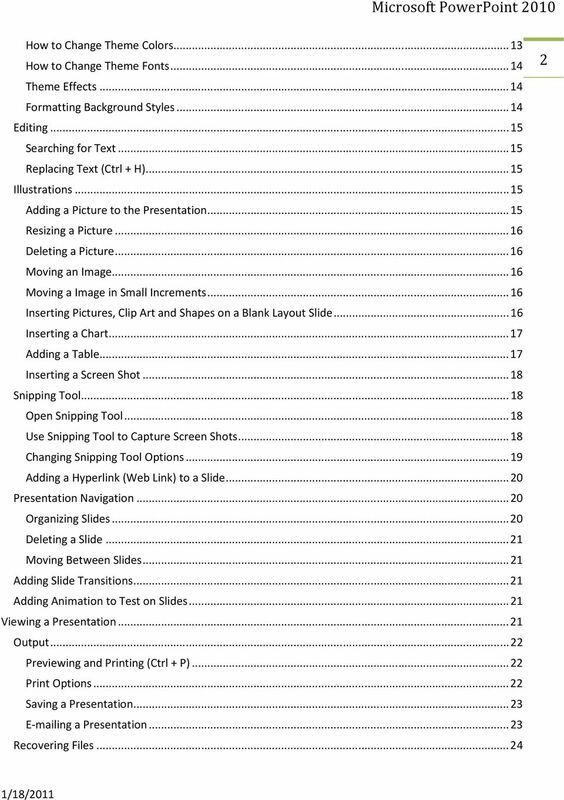 : the current slide number and the number of slides in the presentation)and shortcuts. 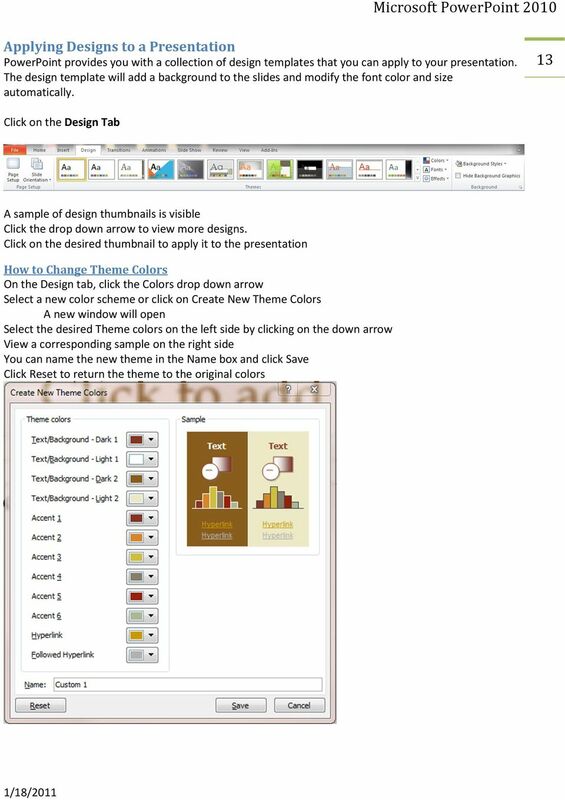 The following buttons allow you to change the view of your PowerPoint presentation. PowerPoint Window The left side of the screen is the Slides/Outline Pane. 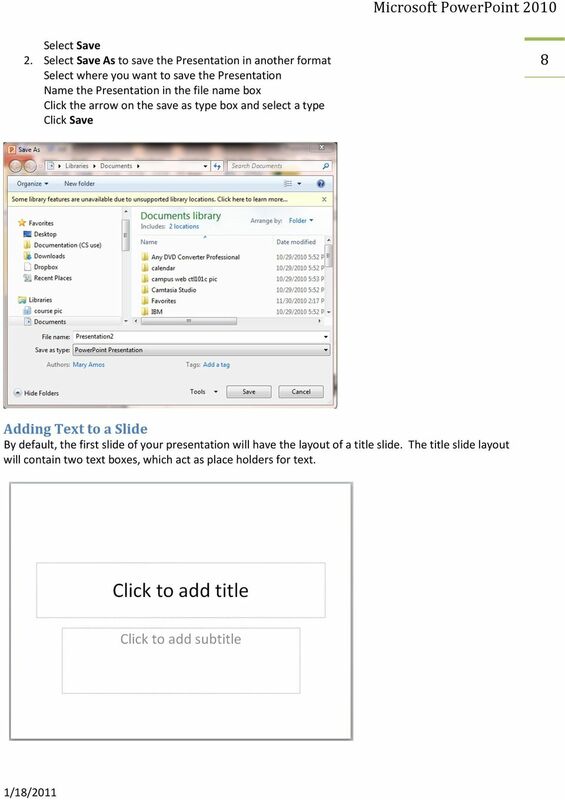 The Slides tab displays the slides as a thumbnail. You can navigate to different slides by clicking on the desired thumbnail. 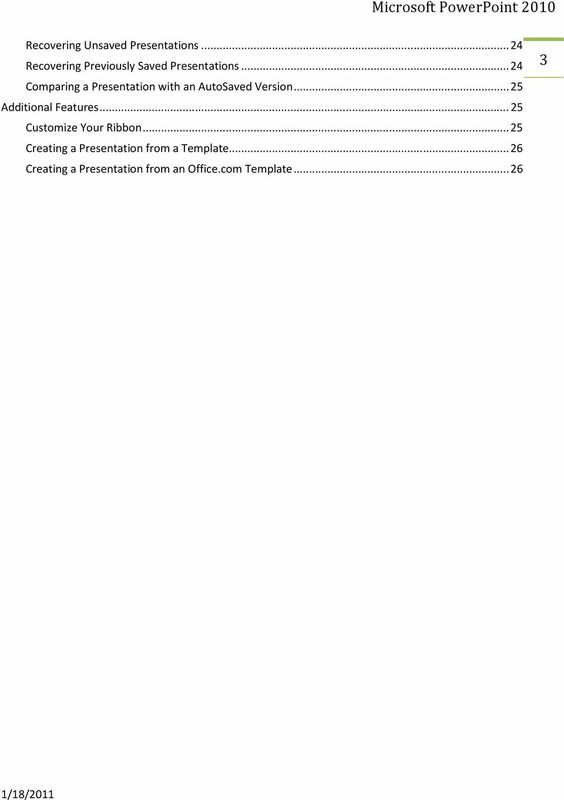 The outline tab will display an outline of your presentation. The slide plane is on the right side of the screen. 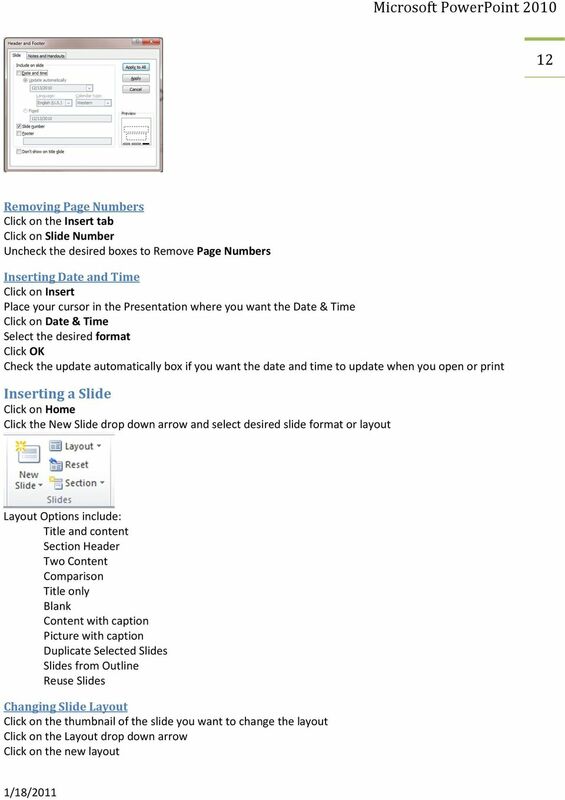 This is where you will add content to the presentation. The Notes Pane is located at the bottom of the slide pane. 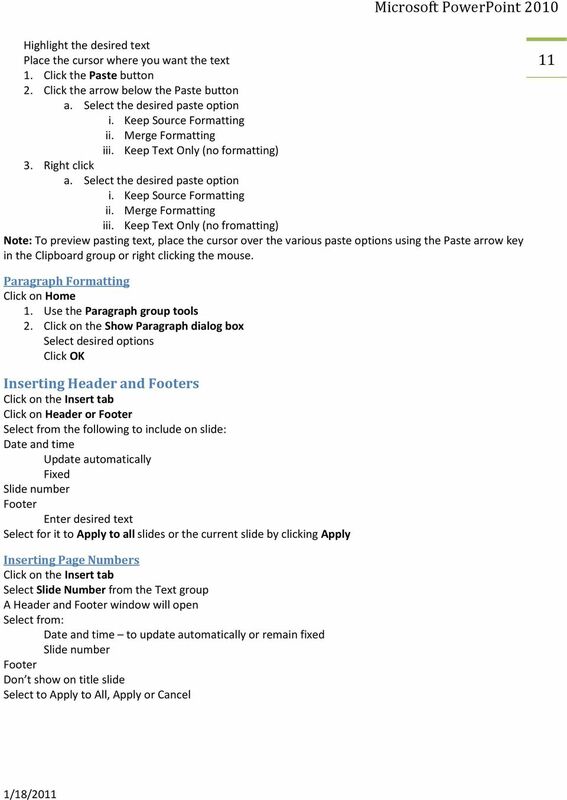 This is where you can add notes for each slide in your presentation. 9 Select Save 2. 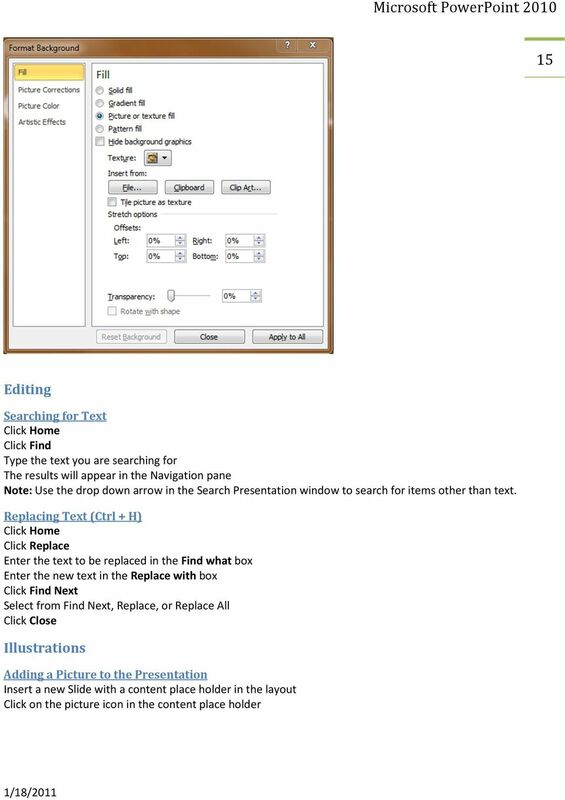 Select Save As to save the Presentation in another format Select where you want to save the Presentation Name the Presentation in the file name box Click the arrow on the save as type box and select a type Click Save 8 Adding Text to a Slide By default, the first slide of your presentation will have the layout of a title slide. 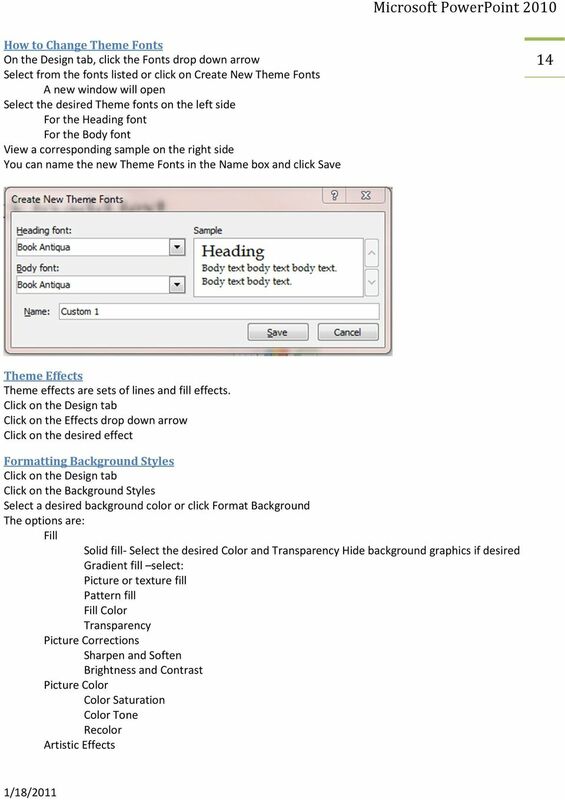 The title slide layout will contain two text boxes, which act as place holders for text. 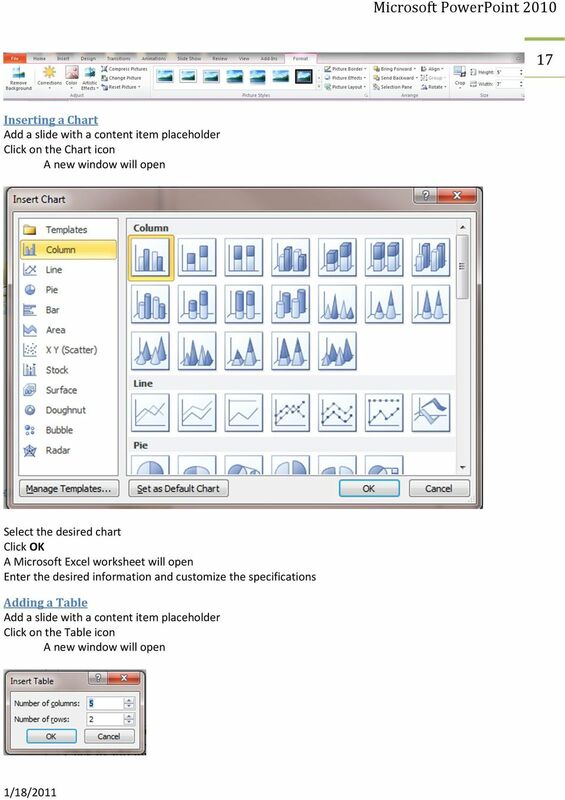 17 16 Note: You can also select Insert Table, Insert Chart, Insert SmartArt Graphic, Insert Clip Art or Insert Media Clip. Hover your mouse over each icon to see a description. Locate the picture, select the picture and click Insert Resizing a Picture Note: This is the same method used to resize a text box. Click on the image to select it Place the mouse on the handles or circles The mouse will turn into a double sided arrow Note: The diagonal handles will allow you to resize the height and width of the picture at the same time. Left click and hold on the handle and drag the image outward to increase and inward to decrease the size Release the mouse and click away from the image to deselect it Deleting a Picture Note: This is the same method used to delete a text box. Click on the picture to select it Press the Delete key Moving an Image Click on the image to select it and hold down the left mouse button Drag the picture to the desired location Release the mouse button Moving a Image in Small Increments Click on the image to select it Use the arrow keys on the keyboard to move the text Click on a blank area of the slide to deselect the image Inserting Pictures, Clip Art and Shapes on a Blank Layout Slide Click on the Insert tab Place your cursor where you want the illustration in the Presentation 1. Click Picture to insert a picture from a file Locate and select the file Click Insert 2. 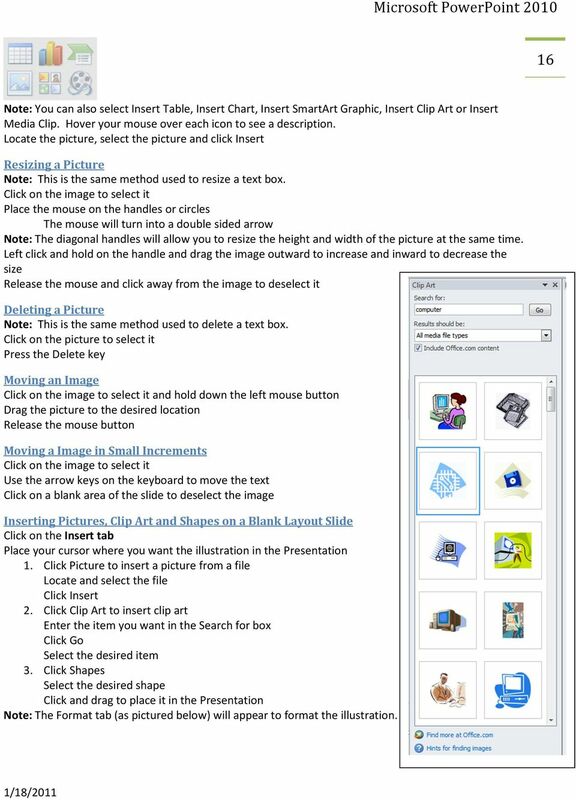 Click Clip Art to insert clip art Enter the item you want in the Search for box Click Go Select the desired item 3. 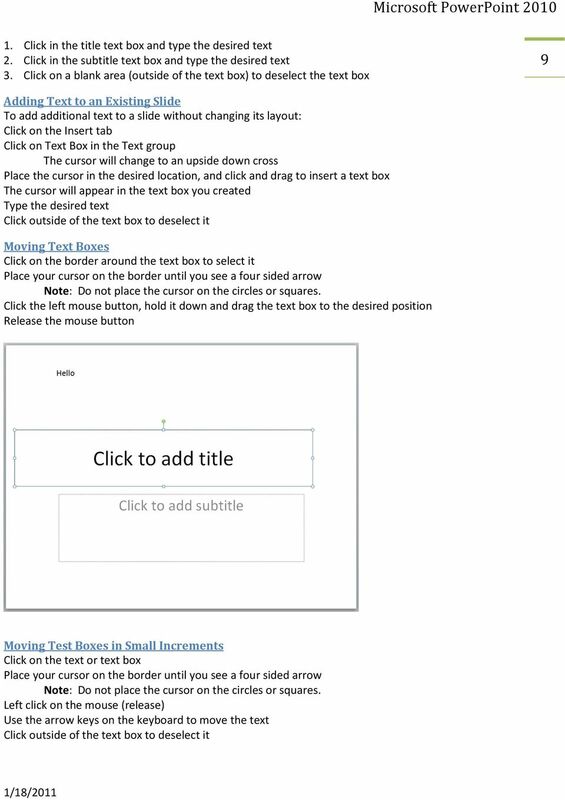 Click Shapes Select the desired shape Click and drag to place it in the Presentation Note: The Format tab (as pictured below) will appear to format the illustration.